The Donnas do indeed Get Skintight on their appropriately same-titled new release on the Lookout label. Offering a Ramones view of the world from a female vantage point, the songs are teenage-fast and fun. Hyperactive, out all night, searching the streets or going to the mall case he'll never call, The Donnas capture the gamut of those roller coaster high-school emotions. Barely out of high school, The Donnas' story starts with four families moving to Palo Alto, a city just south of San Francisco. Donna C. and Donna R. met in fourth grade where they become best friends. In fifth grade, they were introduced to Donna F., and though they weren't a team yet, the performance bug bit them while on a field trip to Hawaii for a hula dancing showcase. Donna A. came into the mix in the eighth grade and the rock and roll party began. The Donnas will leave skid marks on your heart. 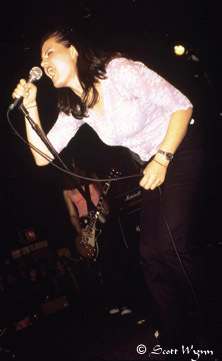 First they were Ragody Anne, ripping it up at age 14, covering songs by Shonen Knife, Syndicate of Sound, The Muffs & L7. Then they were The Electrocutes, a punk rock riot grrl influenced foursome. They would practice in Donna C.'s garage., and boys from their school would come by to watch and openly insult their band. "It sucked," Donna F. remembers. They were always unpopular in school. Finally, they became the Donnas, with the help of Darrin Raffaelli, who had written some songs which they recorded for his label, Super*Teem Records. The Donnas put out a full-length and three 7"s on Super*Teem, all of which are now out-of-print, highly collectible items. By the time 1999 rolled around, The Donnas were recording their third full length studio album, Get Skintight, an album completely written by The Donnas, except for their Motley Crue cover, "Too Fast for Love." The Donnas will leave skid marks on your heart. 1999 ©TransACTION Inc. All Rights Reserved.